In her personal story about living with rheumatoid arthritis, Jenn shares about what its been like living with RA for the last 21 years – the good, the bad, the ugly, and specifically she shares about her daily battles with the disease and how she manages her arthritis pain most effectively. 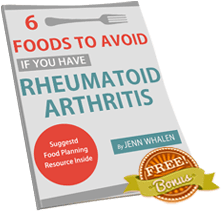 CLICK HERE to learn more about the resource Jenn mentions at end of video that has absolutely had the biggest impact on managing her rheumatoid arthritis pain. Krysti: Hi I’m Krysti and I’m here with Jenn my sister. The reason for recording this audio-video is to share a real-life story about living with rheumatoid arthritis and what it means to be diagnosed with RA. We’ll talk about some of the struggles and the successes that happen with the disease, from a personal account. So the goal is to be able to chat with you Jenn and to talk a little bit about what it’s been like through your journey. That way people who are dealing with the same challenges can relate to your story and recognize that they’re not alone in their journey through this disease. So first and foremost, I want to tell your story, so maybe you can start out by telling me how you found out that you had RA. How old were you? What was it like in the beginning. Jenn: Okay, I was fourteen and I felt like I had jammed my finger. My finger joint swelled up and it was probably for, I don’t know, a week or two and then I realized it’s probably not a jammed finger, maybe something’s wrong, maybe it’s broken, I don’t know. So I told my mom and then my mom took me to the doctor and our primary care doctor, my pediatrician, said that she thought it was juvenile rheumatoid arthritis and that she was going to send me to a rheumatologist. She said, that even though I hadn’t presented all the symptoms for RA…I think you have to have symptoms for like six months, or for a certain amount of time before they’ll actually send you to a rheumatologist, she said that that’s what she pretty much thought it was. So they sent me right away to the rheumatologist and did blood work and urine tests and everything like that and confirmed that it was JRA. Krysti: So you were fourteen when that happened? Krysti: So when you went to the doctor to get the blood tests and everything, did they tell you about your diagnosis, did you have to come back? Tell me a little bit about that process, if somebody is experiencing symptoms now and they’re curious about what it’s like to go to the doctor, what to expect, I’m sure things change over time, but what was that like for you? Jenn: Yeah I think it’s probably a lot different now than it was back then but essentially my pediatrician just said, “You have juvenile rheumatoid arthritis,” and I had no idea what that was and what it even meant. So it didn’t even click or mean anything to me at that point in time. I just went home and somebody said, “What’s wrong?” and I said, “I have arthritis,” and went about my day. So it didn’t really have any effect on me then, the physical symptoms weren’t bad enough then for me to realize what an impact it was going to have, but it didn’t take long for the physical symptoms to come. Probably within a month, maybe two months is when all the physical symptoms started getting really bad. For example, I couldn’t open the truck door to get in the car and I couldn’t open a milk jug and going upstairs was really hard because my knees had gotten so swollen. So, it was little things like that started happening in my daily life, then I started realizing that everything is different. Krysti: Right and so for you as a fourteen year old, you talked about some of the physical changes that started to happen, how did that affect life as an adolescent? Were you active as a young person or maybe you played an instrument, how did that affect your life in terms of your joints starting to swell? Jenn: Well I was a soccer player, so when all those things started to happen it made it impossible for me to run, so I couldn’t play soccer even though I would try. Then I would go to the rheumatologist and he had basically said that I was done playing soccer, that I couldn’t play anymore, that I wasn’t to play anymore and that if I chose to play anymore, by the time I was thirty I would be in a wheelchair. Krysti: So how did you take that news? Jenn: It was probably the hardest thing ever because soccer was my life. You go from playing every single day to then not being able to play, not knowing why you can’t play. Then somebody tells you why you can’t play and that you cannot play anymore. So it was hard and I didn’t really know how to cope with it or deal with it, I just kind of continued to go on with life and try to figure out a way to play again, even though I couldn’t. Krysti: So when you were young and when you first got diagnosed, was there a conversation around remission or how to manage the disease, maybe we can talk a little bit about that? Like drug management and diet; exercise anything that had to do with how you should be approaching this disease, considering you were getting diagnosed at such a young age. What was on the docket, in terms of your approach as it were, with your rheumatologist and your family and how you were going to attack this disease? Jenn: Well immediately my rheumatologist put me on some heavy, heavy drugs Methotrexate, Plaquenil, steroid shots. He also did injections of cortisone and it took a while for the drugs to work. So it was a struggle; calling the doctor, going back to the doctor, “This isn’t working,” upping medication and lowering certain ones, increasing others until we finally found the right balance of something that made it possible for me to actually just get through my day and not be stuck in bed. There was always talk about medication from the doctor’s perspective and then mom decided that she wanted to try to figure out another way to help relieve the pain and the symptoms. So she took me to a naturopath doctor who food allergy tested me and we found out that I was allergic to everything, like literally everything, all the way from A to Z. I can’t even think of them all; wheat, dairy, all the cheeses, every single kind of milk, yeast; baker’s brewer’s, peanuts the list just goes on. I think there was a list of maybe a hundred things and they gave you a range of how allergic you were to these things. The biggest things for me were wheat and dairy and yeast and so at that point in time I would wake up in the morning at six and leave the house by six-forty and I didn’t get home until six. So my mom really struggled with trying to implement a plan that would help me through nutrition because she had no control over what I could consume when I was away from home. Krysti: Were you open to that at a young age, was that something that you understood that you could help your disease with diet? Jenn: Not really because once we realized what I was allergic to and I think mom probably realized that there’s absolutely no way that she could control what I consumed outside of breakfast and dinner, you know snacks and lunches were gone, so there wasn’t too much of an effort, I don’t think, to try to change things. I know mom tried to go to grocery stores and find things at that point in time that she could control at home but she said that at that point in time there was no foods, no natural markets, no gluten free, there was no alternative to dairy free. So really it was almost impossible for her to, from what she researched, there was no way she come implement. So we didn’t, we just did the medications. Krysti: So going through your young adulthood, did you ever have the experience of being in remission or feeling like you were making progress with the diseases that related to kind of halting its progress as you started to grow with the disease? Jenn: Yeah, after a year of being on the medication I was physically able to run again, so I started playing soccer again, against the doctor’s will or suggestion. He again told me not to do it but it was such a big part of my life that I did and I felt good because the medication was working. So I felt well enough to play but the physical symptoms had already taken a little bit of toll on my body, like my ankle and my knees were always swollen, my fingers were swollen and so I didn’t have the flexibility in my ankles and little things that you don’t realize when you’re young. Remission was talked about and at one point in time they actually told me that I was in remission, from the drugs, from the medication that I was taking, but they never took me off of them and I always had to take them. Eventually I just got tired of taking the medication and I think that I had this false sense of healing because they say that you’re in remission. So I just stopped taking the medication for a little while; a couple of years and everything just came right back. So you realize that you’re not really technically in remission, you’re just in a sort of like medication induced remission. Krysti: I see, that’s interesting. So when it comes to the approaches to managing RA that kind of plays into it and you’re saying that medication is obviously a huge part of anybody who is diagnosed with this disease and is going to have to work through those elements and the drugs and the medication. Considering that you’ve been living with this disease for over two decades, what do you feel has worked best for you, in terms of managing the day to day pain and what’s made the biggest difference in your life? Maybe that’s changed over time. Krysti: Maybe in different phases you’ve had different experiences? Jenn: Obviously when I was younger the medication worked and it worked well enough to get me active again and then when I was not on medication, I just kind of pushed through it mentally. Some days would be harder than others; you’d get up and you’d have a flare-up and you couldn’t get out of bed so you wouldn’t be able to go to work or go to school, whatever you had to do that day. Then when I got a little bit older we tried another naturopath approach, I think I was in my twenties and that really helped. So for me, I think that when I was younger it was a lot of medication and then as I got older it was realizing that through your diet you can control as much as one can control it. You control the pain that you’re going to be in through what you eat. The way it was explained to us was that something’s going on in your gut and the foods that you eat create havoc in there and then that’s how the disease starts to get worse, permeating the stomach wall. It’s all very technical and ‘doctory’ but once you realize that you also learn that if you remove the trigger foods, then you remove a lot of the pain and swelling as well. So for me a lot of the big trigger foods are the wheat, the dairy, the yeast and that’s almost in everything. So essentially, if you’re going to eat a breakfast find a gluten free cereal with dairy free milk and then your lunch is a great huge big salad and then for dinner, again just sticking away from those foods that trigger you. That really helps your body not have those reactions and so the pain and the swelling go down. Then post-kids obviously was a little bit different because it came on strong again. Krysti: Maybe talk a little bit about that. So you’re a mother of two, how old are your kids? Krysti: Okay so maybe you can talk about that. What was it like to make a decision to have kids, was that a challenge for you, in terms of what it was going to do to your body physically and anything in terms of long-term visions about being a mother? Was there a lot of conversation about whether you should have kids because you have RA, was that a struggle for you at all or was that not, that didn’t have any effect on you? Jenn: No not really, I always knew I wanted to be a mom and so it was never a question of should I, I always knew I wanted to be a mom and that my husband and I always knew we wanted to have kids. So it was more a question of when do we think we’re ready? We had researched it and learned that most women with RA go into remission when they’re pregnant. So our focus, prior to having kids, was to make sure that I was off all of my medication at least two years before we even tried to have kids, just because of the negative effects that all the medications can have. They tell you, you only have to be off like four months, but we just really wanted to play it super safe, so we stuck to the nutritional approach two years prior and it really worked for us. I was able to go about my day and go to work and lead a semi-active life. I wasn’t running marathons or playing soccer, but I could get a little exercise in and lift a little bit of weights, but for me I didn’t go into remission when I was pregnant so it was a huge letdown. So with my first I was able to manage the pain without any medication through the first pregnancy and then I was in pain and I was in more pain than I had been prior to getting pregnant. So I knew something was kind of weird with me. I didn’t go into remission, I still experienced the pain and after the baby was born it just like magnifies by thousands, like the pain just skyrockets. You know, you’re breastfeeding and you can’t really take medication because you’re breastfeeding and I wanted to breastfeed that was just the choice that we had, we knew that was the healthiest thing for our kids, for our family. So we chose that and so I then chose not to obviously take any medication. So the pain was really bad and you struggle because you’re not getting any sleep and you’re irritable and tired and in pain and it just makes it hard, but it wasn’t anything that we couldn’t get through. We just pushed through and got through it and then you’re kind of just a mom and just getting through the day and then having another one and deciding to do it. The second was really, really hard because the pain never went away from after the first. So you’re in a lot of pain as opposed to minor pain and it was that way through the whole pregnancy. Then after my second was born, again the huge skyrocket of pain was there and breastfeeding him as well. So it was hard, the second one was really, really hard. The pain that came after the second was probably the worst in my life that I have ever dealt with. Then we obviously had a choice to make after the second was born; do we want to have more or what shall we do? Our decision was that, while we may have wanted more kids, I could probably be a really good mom to two and let’s get me healthy again so that I can be a really good mom to two, so that was the choice. Krysti: A question about the pain as it related to the pregnancy stuff; I’m just kind of curious. So when you’re pregnant you have cravings and maybe the diet isn’t as tight, I don’t know. Maybe talk about how you handled your diet through that time, was that still a really important piece to the puzzle? Do you feel like some of the pain after the pregnancy had anything to do with a change in diet or was there something that was happening or just happened to be triggered by having a baby and then not being able to be on any drugs and it just seemed like that pain continued to get worse and worse through the pregnancy and then even worse after? Was that just the trend that you felt or was there, maybe outside or environmental things that were happening that may have triggered that? So I definitely wasn’t super strict on the nutritional plan during the pregnancy but I tried my best and I think the foods did affect my pain levels post-pregnancy because you’re trying to consume extra calories so that you have enough milk for your child. I wasn’t as strict on the nutritional side but the pain was so bad, like so bad that I knew that it wasn’t just the food, I knew that it was something else, like something had happened in my body. I don’t know what it was but it was pretty severe. Krysti: So then how did you come down from that? What was the transition for you, was it getting back on medication that helped you to really reduce your pain? Maybe talk about life after kids and what it’s like to come down from that. If somebody is in a situation where they’re experiencing really high spikes in pain levels, probably something a lot of people deal with for different reasons, whatever their trigger may be, if it’s pregnancy or something else, what was your next step, like when you go through something like that and you realize, “I can’t live like this, there’s just no way,” where do you turn to next? Did you go to your rheumatologist, did you try and talk through it with your husband, what was your next step there? So we knew that we needed to see the rheumatologist. We knew that the nutrition plan would work but we also knew that we needed something super strong because my pain was so bad and my swelling was so bad that we needed immediate help. So we went back to the rheumatologist and started on a new medication plan and it helped. It’s still the trial and error of what medication works, which one doesn’t, in combination with this other medication and some of them make you crazy, whereas before, when I was taking them when I was younger I didn’t feel like I was crazy. So it’s really hard to find the right balance but it’s good to just keep going through the motions with your doctor and stay in contact and make sure that you’re honest with yourself and your doctor about all your medications and your side effects. So after we got me feeling much better physically and mentally and emotionally then we started to plug in the nutrition side as well and so that’s where we’re at now, kind of a nutrition and medication. Krysti: A question about that because you’ve had twenty years of experience with this and I don’t even know the answer to this question but how many rheumatologists have you had and what are maybe some of the qualities that you look for in a rheumatologist? Jenn: I’ve only had two rheumatologists. I have seen a lot of them, I’ve seen probably five or six and it’s hard to find one that you really, really like. Even when I was younger I did not like my rheumatologist at all but looking back he was very good and I’m glad that my mom chose him for me. He was very aggressive in treating it and I think that’s important because you have to prevent the disease from advancing. If you’re not aggressive enough then it’s just going to continue to get worse and worse and worse. So I’ve had two who I trust and many more that I’ve seen that I did not trust. Krysti: So what helps you to trust them? Is it their aggressive approach with the disease? Is there anything else that you would say that would help somebody that’s out there who’s struggling to find someone that they can really trust? Jenn: I think you just know. That’s one of those things like when somebody says you know that you’re in love, you just know. It’s the same thing with your rheumatologist, you get down into the room with them and you just know whether or not you trust them. Now it’s different for a kid because a kid is looking to have their needs met and their wants met and if a doctor doesn’t necessarily give them what they want, like for me it was, “You took soccer away from me and being athletic, so I don’t like you.” Twenty years later, looking back that was actually a really smart move on his part but you just know, you sit down and within five minutes you know. Krysti: Okay so in kind of wrapping things up, just getting towards the end here, there’s obviously the physical battle that goes on with RA but there’s also the mental battle of knowing that you’re kind of stuck with this disease essentially. So is there anything, from a mental standpoint that has helped you to get through the day to day stuff? Obviously you have long-term thinking with this disease and like you said, the planning with your rheumatologist and how you keep if from progressing and there’s that big picture of thinking, but so much of the challenge that people are dealing with is the day to day stuff, just making it through the day. So what has helped you mentally or to stay strong mentally? Maybe there’s things that have helped you through your journey that you could share with everyone. Jenn: Well I think that first and foremost, realizing that you can’t beat this disease by being strong mentally, it’s probably the first thing you have to realize. Just because you’re really strong mentally doesn’t mean that you can beat this disease. So I could go out and tell myself I’m going to run four miles and I’m mentally strong enough to do it, but it’s not an intelligent thing to do because physically my body will just break down. So you have to realize that mentally, you need to use your mental strength in a positive way as opposed to a negative way. Instead of trying to beat the disease mentally and overcome it mentally, you have to think of a way or realize by doing research, what’s the best route for you to lead a healthy life. So that helps mentally, just knowing that you’re doing something to stop it and that you’re not just getting worse. Jenn: But the cool thing about the nutritional approach is that you start to realize that if you don’t eat something, that you’re in more control of your body than the disease is, because the triggers aren’t triggering that operates pain and swelling. So mentally that gives you a feeling of goodness and a sort of power over what you have, whereas you don’t have that when you’re just taking medication, because you’re not in control. The disease still is, you’re just hiding all the pain under some medication whereas with the nutrition you’re actually stopping the reaction from occurring so you feel very powerful and it just boosts your… you just feel better, you just feel good like you actually have a little bit more control back. Krysti: So when you are feeling really good and you feel like you have control over your RA, are you into exercise? Maybe you can talk a little bit about the physical side. It is a challenge obviously physically to pull yourself out of bed, to do certain things, especially when you’re tired or fatigued and there’s all these reasons to say why not, but one of the things that every rheumatologist will say is that it’s really important that you continue to exercise. There’s a lot of different reasons for that but have you been able to strike a balance or maybe you can talk about the things that you’ve tried that you liked and didn’t like, maybe didn’t like first and then what is working for you, if something’s working for you now? Jenn: That’s another big change that has occurred in the last twenty years. When I was first diagnosed, I was told not to exercise and not to run and to limit my movement because that was just going to make everything worse. So luckily that has shifted, the approach has shifted and now it’s, yes you do need to move and you need to do low impact exercises. I think first of all you have to have it under control. If you’re just in a ton of pain every single day and you can barely get out of bed and barely get through the day, then you’re not going to be able to even move. You’re not going to go on walks, even if it’s just a gentle stroll around the block, you just can’t, you can’t do it, you just don’t have anything to give. So first of all you have to get it under control whether it’s going to a doctor and just stopping the progression or if it’s taking a really radical approach that’s not necessarily radical but it’s intense. If you’re going to do the nutritional approach, do it to a tee, you have to do it to a tee to get it under control. So getting it under control is the first step to being able to move again. Then once you can move again, yeah I think I’ve tried everything like, I know I shouldn’t run but I love to run because it’s just my background. So I’ll just try to run and see if it works this time, but no it doesn’t work so okay. I’ve tried bike riding. Bike riding for me worked for a long time and then it just got really hard; the movement from my ankles, I just don’t have the flexibility in my ankles so it became more painful for me to ride so I went to find something new. Somebody said try swimming. Swimming didn’t work for me because I have arthritis in my elbow and doing that motion of pushing your arm through the water is very painful on my elbow, so swimming did not work for me. I tried lifting weights and you feel real good when you’re doing it but the next day you’re wrecked. You’re real excited; exercise today and the next day you can’t move because you have a massive flare-up from lifting weights. I tried Yoga. Yoga doesn’t work for me because of the limitations in my joints. I can’t physically do the exercises that you have to do in Yoga so somebody introduced Pilates to me and that was like heaven because you can move and it doesn’t hurt and it not only doesn’t hurt that day, it doesn’t hurt the next day or the day after. So you can move again and you feel this great sense of excitement because moving feels just so good. Jenn: So Pilates is fantastic because it’s non-impactive, completely non-impactive but you sweat and you feel good like you’re actually getting a workout and so I love doing Pilates. Krysti: So is that your routine, are you doing any other exercise other than Pilates or is that primarily what you’re doing from an exercise standpoint to keep your body healthy? Jenn: I do Pilates and I have stopped trying to beat it mentally and try to like keep running or keep doing this or keep doing that. I know that Pilates is not impactive and that it’s actually healthy for my joints, whereas a lot of the other exercises that I’ve tried in the past, they may feel good at the time, but they’re not really good for you; for my joints, they’re not going to make my joints healthy whereas when you do Pilates you actually feel like you’re helping your joints get healthier. So I do Pilates but now I can play with my kids. If the kids want to go for a walk around the block, I can go around the block with then twice, three times if they want to go whereas before I could barely get to the end of the road. So if they want to ride their bikes, I can hop on a bike and I can ride a bike with them. For me that’s the most important thing, actually being able to move with my kids, get in the pool and swim with them, play a little bit of soccer in the back yard; gentle soccer. But just Pilates makes me feel very good and I feel like I have control over the physical side of my body. Krysti: That’s great, I’m glad that you found relief through Pilates, I think that’s awesome. I have an interesting question for you; my final question but before I get to that I just want to do a quick rundown of the symptoms that you’ve experienced, just so people listening can get a sense of the types of symptoms that you’ve had to go through. We’ve kind of touched on some of that but talk to me a little bit about what that’s been like for you, in terms of symptoms through your progression. Jenn: It’s fairly simple, it’s pain, swelling and fatigue and fatigue; massive fatigue. Sometimes you think the pain is the worst and other times you think the fatigue is the worst just because you literally feel like you can’t do anything, you’re just so exhausted. So diving a little bit deeper it would be like every joint is pretty much affected. I have joint pain and some swelling in my fingers, in my wrists, in my elbows, in my shoulders, my toes, my ankles, my knees and my neck has also felt symptoms. For me now, having it for so long and not being very consistent with my approach in how to battle it, I think that I’m a little bit worse because now I have deformities and I have lack of range of motion in my ankles, so I have things that prevent me from physically doing certain things now. So depending on where a person is, but the pain, the swelling, the fatigue. Krysti: So if you could go back, let’s say you could rewind twenty-one years and you were fourteen all over again, what would you change about your approach with RA? How would you do things differently if you would do things differently? Jenn: I would definitely do the nutritional approach. I think that if we had then what we have now, then that would have been massive for me. Krysti: In terms of accessibility to foods and stuff? Jenn: Yes accessibility to alternative foods, that would have been huge, just being able to have a gluten free breakfast for example or for a sandwich bread, knowing that’s my trigger or just something simple like almond milk or rice milk that was just not accessible, dairy was the only option and we were huge cereal eaters. So I would say that if the nutrition aspect of it was available then that would have been something that I think would have been more valuable to me then. So I would change that, I would have definitely taken a more nutritional approach in controlling the disease. Jenn: Replaced it, I just never found a good replacement for it until twenty years later. Jenn: So I would encourage people to do that, to find a replacement for what they love, if it’s not healthy for their body. So I would go back and make all those changes. I would wear healthy shoes and get inserts so that my arches aren’t falling and I would eat healthier and make those nutritional choices knowing that they are going to impact you if you don’t make those choices now, you’ll wish you had twenty years later. Krysti: So I’ve heard you talk a lot about nutrition. Obviously that’s a big part of what’s helped you to manage your RA, along with working together with your rheumatologist on any drug plan that is necessary for you and everybody is unique in that regard. But when it comes to the nutrition side of things, are there a lot of challenges that go with new diet plans? You’ve mentioned that before; how important it is for you to really be prepared for your nutrition plan so that you don’t find yourself falling off the wagon or you’re not cutting corners, you’re really kind of making sure you’re crossing all your T’s and dotting all of your I’s. So in your experience, there’s so many diet plans out there, so many different options that people can try and again, RA being a unique disease, people have success on so many different levels in terms of the spectrum with nutrition. So I can understand that, but what nutrition plan do you enjoy or do you have anything that you would recommend from a nutrition plan standpoint, that you think could potentially benefit anybody that might be listening? Jenn: That’s an interesting one. The nutrition approach is so amazing because it can have such a big impact on your disease and how you fight it and on your quality of life, but at the same time part of your disease is that you’re in pain and you can’t move very well and you’re really, really tired. So the nutritional approach takes a lot of mental thought and it takes a lot of preparation and that is a really tricky combination with having arthritis. So I think that, for me, in trying different things in the past, I found it hard to stick with it because I was always having to come up with the dinner or come up with the replacement food or what I could eat, I had to do all of those mental processes; what’s okay, what’s not okay. Is this okay to eat? Is this a good replacement? Is this ingredient even okay, I can’t say it, but is that something is should have? So for me I tried The Paddison Program and it is by far the greatest thing on earth because it is all laid out for you, everything is clear-cut and planned. You don’t have to do any of the thought process all you have to do is read it and follow it. It tells you what to do on this day, what to do on the next day, what to do on the third day, what to do on the fourth day. It tells you everything from what day to eat and at what time to eat it and then it breaks it down further, it tells you exactly what to eat. It makes your grocery shopping list for you because it’s all there. So you don’t have to put in that mental effort to do it, all you have to do is put your mental effort into following the plan and sticking to the plan and that makes it so much easier to stay on the plan when it’s all prepared for you. It’s all laid out and so it makes it a lot easier to stick with it and to not hit bumps in the road or not fall off or things like that. Krysti: Yeah, so The Paddison Program, okay. So it sounds like the direction that’s provided, it’s not just the food and the diet and the nutrition and telling people what to do but it’s how to do it, so that really seems like a big difference in the program that you’re talking about. I think that’s awesome, that’s great and I’m excited to learn more about that. Alright Jenn well I just want to say thank you for your time and sharing and most importantly, I think getting your voice out there is really a critical part to this community, the RA community and that’s really what this website is all about; connecting people that suffer with this disease and trying to provide natural solutions because that’s a big part of what is going to help, as you kind of mentioned today, with The Paddison Program and just how diet and nutrition has really helped you. So thank you so much for sharing your story and I know it’s going to help a lot of people and until next time.